It’s surprising that they are running such an in-depth article on her. But I was also intrigued to read about her teaching on the Beatitudes. I found she has a book that talks more about it, so I got the Kindle edition (Compelled by Love) and started reading it. It reminds me of how I was not fully getting the concept of the Kingdom of God (the 1959 book The Gospel of the Kingdom by George Eldon Ladd really helped me on that subject). But I never really “got” the Beatitudes. What does “poor in spirit” even mean? How are those who mourn comforted, by God? Will they be comforted by Him here on earth, or in heaven, or by us, or what? Well I was reading Heidi’s book this morning and she was talking about comforting a severely abused child whose pain was so great that all she did was cry and she never spoke. 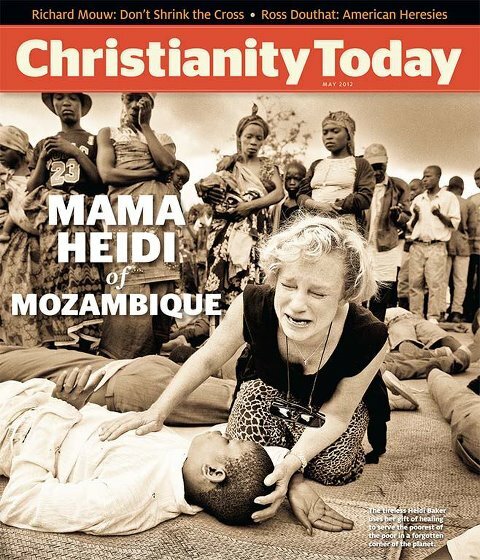 Heidi says: Here was this beautiful, abandoned child who had seen such pain that she could not talk. Constancia had experienced too much agony to talk. Silent tears just continually streamed down her face. She didn’t know about revival, and I had no clue what revival even looked like. I did not yet realize that the Sermon on the Mount is God’s formula for revival. The Beatitudes are His recipe for His kingdom to come and His will to be done on earth as it is heaven. Next Heidi talked about another abused girl named Beatrice who started to just love on Constancia: Through this little girl, Beatrice, God taught me about the Beatitudes. Beatrice had love. She was my teacher for love. Beatrice personified a comforter to someone who was deeply suffering and mourning. Because Beatrice understood suffering, she was also able to understand our beautiful, tiny, mute girl Constancia. I saw Beatrice stop for Constancia. After she had only been out of the hospital for a few weeks, I remember watching the first time as Beatrice picked up Constancia. I watched day after day as she simply loved on that tiny girl. She does not have a poster, a book, an itinerant circle, or a speaking schedule. But she has a ministry that brings the very heart of God to the heart of man on Earth. She trader her sorrow for His joy. She exchanged her ashes for His beauty. Often we want the kingdom to look like the multitudes to make our church grow and make us look good. But the kingdom really looks like one smiling child at a time until nations are full of people who are passionate lovers of God. And so now I am beginning to understand the Beatitudes. They are a picture of how we are to bring the kingdom of heaven down to earth. Jesus taught us to pray to the Father that His kingdom come, thy will be done. And of course we know we are to care, love and minister to people. But I never put two and two together that by doing ministry, especially to the poor, that is exactly how the kingdom of heaven comes down. Those who mourn will be comforted – because those who are seeking God’s kingdom on earth, who are praying to do God’s will, will sense His compassion, and pour out comfort, and His kingdom to these people. Those who are poor in spirit, means those who have a hunger in their spirit, who don’t have all the answers, but yearn for God. Theirs is the kingdom of heaven because God has sent us to bring Him down to them. They are seeking, and God answers both their prayers and ours, and the kingdom of heaven comes down. This is beginning to make sense to me. What is revival? It may be many things, but fundamentally it must be the kingdom of heaven coming down to earth, into our lives, and into the lives of those we comfort. But let me add one more thing. Heidi tells how at first she prayed and prayed for people to be healed and nothing would happen. Then, over a short period of time, Heidi prayed for three blind women who were completely healed. The thing is that each of these women’s name was “Mama Aida”. God was clearly telling Heidi something and so she asked God what it was. Finally, she looked up from praying and saw a vision. She saw the people in the West, only they were poor and starving. God showed Heidi that she had been blind to who is poor. And we are blind to our own poverty. One of the keys for revival in the West then, is for us to see our poverty. As we see our poverty, then we will realize that we are not rich, and we will become poor in spirit. And then the kingdom of heaven can come down to us in more fullness. This entry was posted in Everything Else, Healing Testimonies and Teaching, Kingdom Encounters and tagged Beatitudes, Christianity Today, Heidi Baker by anointed2go. Bookmark the permalink.